Gathering actionable business intelligence from a continually growing mountain of court data requires building searches designed to quickly reveal the heart of the issue being investigated. What often separates court databases apart, beyond access to clean, normalized data, is the ability to use advanced search features and filters to reach the right results you are looking for. Even with Google, using the advanced search tool can make a considerable difference in the refinement of results, but the key is actually using the tools available. In the context of using court data to search for specific companies involved in litigation, there are several easy to use advanced search features within UniCourt’s application that can help you gather the business intelligence you’re after. Here, we’ll go through how to add conditions to your searches, make the most of the Party Type filter, and narrow results by Case Status. With these features, you can quickly find out the litigation relationships between parties, and gain insights into how companies get pulled into lawsuits. When researching a company’s involvement in litigation, it can be incredibly insightful to know who is suing them and why. For instance, Bank of America is constantly embroiled in litigation by the nature of being one of the largest financial institutions in the United States, but there is a sizeable difference between a consumer suing Bank of America and a federal agency or regulator. Adding conditions into your searches can help you narrow down from the 82,148 cases where Bank of America is a defendant, to the litigation that has the potential to affect the company’s bottom line and reputation. Once you enter in your initial search into UniCourt’s app, the results will appear, much like a Google search, with the search you entered appearing at the top of the screen. To create a condition, simply click the + Add Conditions button, then add in the name of the entity or entities you want to see, choose the appropriate Scope and Proximity, and select “Party” for Attribute. 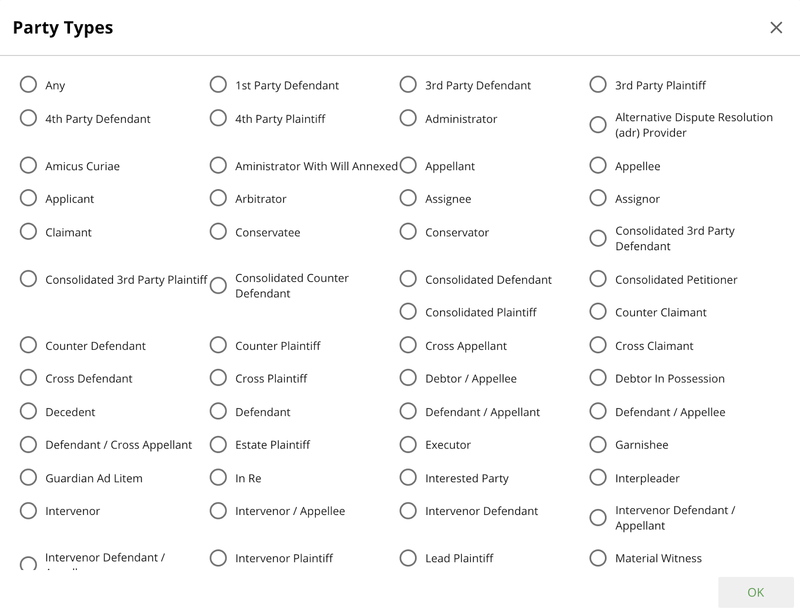 When you choose “Party” for Attribute, the option then appears to choose the Party Type, where you can set the new entity or entities as the plaintiff to see how many times they have sued the company from your original search. For developing more specific scenarios within your added conditions, UniCourt also provides the option to choose from 76 different party types by clicking on “View more Party Types.” Whether you’re interested in seeing when a company is a Trustee, a 3rd Party Plaintiff, an Interpleader, or making a statement as an Amicus Curiae, you can choose from a range of options to see how two or more parties interact in the litigation context. If the company you’re thinking about investing in has several pending cases, that is not only going to be a drain on resources, but it could also signal underlying issues with their products that may make you second-guess long-term investments. Within the Case Status filter, you can also narrow down even further to see how many cases are in a certain stage of the litigation lifecycle, such as Judgment Entered, Judgment Satisfied, Discovery, Appeal, and/or Trial. If a case is going all the way to trial and the company you’re thinking of investing in is a defendant being sued by a sophisticated plaintiff, this could be the red flag you need to see, as going all the way to trial can balloon a company’s legal costs exponentially and add the risk of sizeable damages. From the perspective of financial institutions, leveraging advanced search features to sift through court data can also reveal valuable business intelligence and help predict risks in the market. Banks can similarly create advanced searches with added conditions and filter by Pending Case Type to see if any of their peers are actively being sued by certain counterparties or by government agencies for selling certain products, and then weigh the costs/benefits of continuing to offer similar products to their clients. By using the Add Conditions feature, the Party Type designation, and Case Status filter, along with other helpful filters like Jurisdiction, Filing Date, Case Type, and Dollar Amount, you can save time while gathering actionable business intelligence. 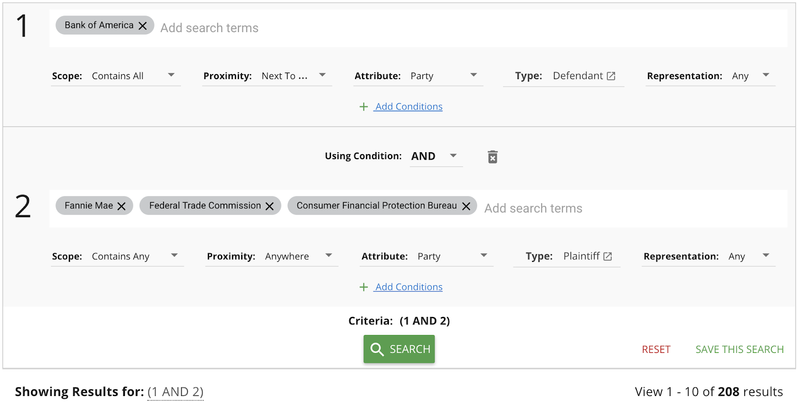 With UniCourt’s advanced search features, you can quickly create the right conditions to get a snapshot of a company’s litigation portfolio and potential future legal exposure.